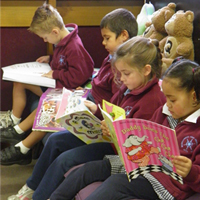 Warrnambool East Primary School sees English as central to the learning and development of all young Australians. It helps create confident communicators, imaginative thinkers and informed citizens. It is through the study of English that young people learn to analyse, understand, communicate with and build relationships with others and the world around them. Warrnambool East P.S. students study English daily, generally in a two hour English Block this comprises the three components of Reading, Writing, Speaking and Listening. With rigorous assessment and planning processes in place, teachers, develop personalised instruction for their students. We are all too aware that children have differing abilities, interests and learning preferences and our goal is for all students to learn what they need to learn and not what they already know. 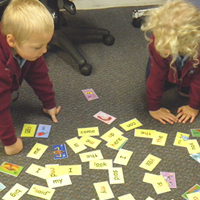 Students across all levels of the school have English goals, which also include Oral Language. They receive explicit instruction at their point of need in small workshop groups and are involved in their assessment and evaluation processes. Every child, Foundation to Year 6 has access to a wide variety of literature and reference books and they regularly replenish their own 'Book Box' with a variety of selected books to read for pleasure, practise or instruction. These books may be selected by Student and or the Teacher. We are very proud of the engagement and progress of our students in all aspects of the English curriculum.